is how the subtle Way of the universe exercises itself. is how the subtle Way of the universe employs itself. All things of the world come from the manifest. Beauty in the oddest places are the best! life will find a way, lovely words and photo. Thank you Holly. Your kind words and thoughts are very appreciated. Graciousness can grow in the harshest of environments… As this little Pansy shows… We can manifest also Peace from Hostility .. All we need do is allow the Universe and her laws to bring her own great wisdom into our lives.. Wonderful Words and Photo Eddie.. The busy-ness of spring is reason, I am limiting posts to 3 per week at this time; instead of the 4 or 5. There is much to keep up with in the garden and around the house. Many would agree. Happy you were able to have your computer returned without much delay or complication. Thank you Sue. Likewise dear friend. Unfortunately, my grandson will not be here. ¨The Manifest comes from the unmanifest, subtle essence of the universe¨. I love that sentence… Heraclitus would be nodding in agreement with you, Eddie!!!!. SSS = simply splendid and stunning… ❤ life can and does grow everywhere, your photo has reminded me of tiny and lovely flowers or plants I've seen over lava fields in Iceland… I did catch the essence of your lines, thanx! Yes, if we look we can find beauty even in darkness, even in cement. Thank you La Potosina. Your kindness is greatly appreciated. How I love this post. The contrast between the bright pansy and the cement urban jungle are so very moving. Hermosa flor que brilla en la oscuridad. Gracias por tu respuesta atento y amable. Disfrutar de la recompensa de la vida. 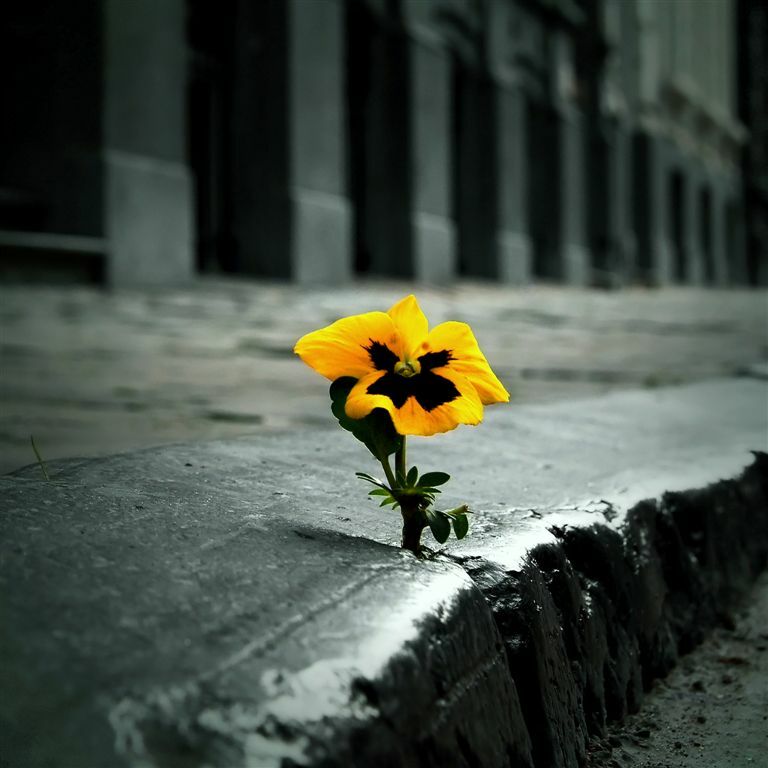 That is one tenacious little flower, taking on the might of mankind. If a small flower can do this imagine the might of nature applied in others ways. That Lao Tzu had it going on. So brilliant. The photo is really, really nice, Eddie.